Fire safety suits have been around for the past century. 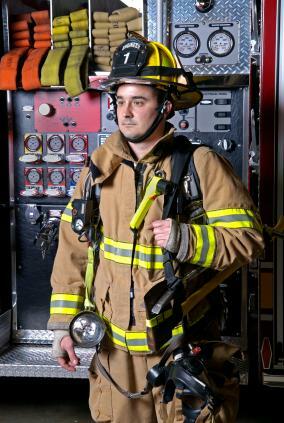 Many improvements have been made to the original fire suits, and there are currently thousands of options for full turnout gear manufactured in the United States and Canada. Read on to find out more about what keeps our firefighters safe when answering the call of duty. The jacket that a firefighter wears is only one item in their turnout gear. It is the largest and an important item in the fireman's wardrobe. What you may not notice about a fire safety suit jacket is the special items sewn into a jacket. For example, special wrist guards are often sewn into the sleeve. This protects exposed skin between the edge of the sleeve and the edge of the glove. Collars are designed with special stitching to keep the collar up to protect the back of the neck and throat. Special thermal insulation sewn into the jackets, especially in the back and chest areas, helps to eliminate compression burns. Jackets manufactured by Globe Firefighter Suits are also made with Kevlar, making them approximately 60 percent bulletproof. A firefighter's pants are also important in protecting him or her from heat and steam burns. New technology has made them lighter weight and some firefighter pants have a built in harness system, eliminating the need for additional hardware. Special reinforced knees and foam inserts help a firefighter to crawl without fear of minor injuries. Additional items that make the pants more comfortable and practical include gusseted cargo pockets, ripcord suspenders, stretch waistbands and zippered pant legs. Boots are a very important part of a fire safety suit. They protect a firefighter's feet from puncture wounds, water and fire. Firefighter boots come in two basic styles- pull on and lace up. The boots are usually made of leather, which is fire resistant. The boots may feature removable foot beds that can be washed and reflective material, which aids in visibility. Pull up style boots have reinforced shanks that add to the life of the pull-on straps. The gloves that are part of a fire safety suit may be the most important part of a firefighter's outfit. Firemen use their hands to help people out of fires, lift and move items that are on fire or smoldering and may come into contact with hazardous substances. Depending upon the situation, a firefighter may handle other gear. Keep in mind that firefighters may respond to emergency calls other than fires. Typical emergency situations that fire crews respond to include hazardous material spills, car accidents, riots, marine accidents and of course, building fires. The gear that they will need depends upon the emergency. The cost of an entire fire safety suit may cost well over several thousand dollars. For example, smaller items such as the helmet and boots can cost several hundred dollars each. However, considering that you cannot put a price on the life of someone, the cost of the necessary equipment is well worth it.